The EconoBead Bead filters are the economical answer to imitation filters, made by the Beadfilter experts! The EconoBead Beadfilter is now available in 5 sizes for ponds 2000, 4000, 6000, 12000 and 20000 Gallons. Comes with a big clear lid for easy access. All EconoBead Beadfilter models are standard equipped with a 2” multi-port valve, a transparent access cap and a powerful blower. EconoBead Beadfilters are constructed from high quality fibreglass conforming drink water standards so they are completely save for your fish. 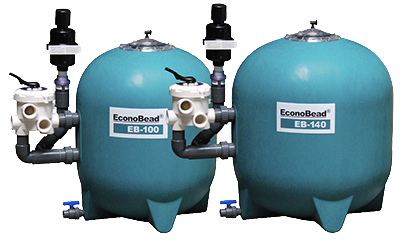 The EconoBead Beadfilter comes with a warranty period of 5 years on the pipe and fitting system and a warranty period of 10 years on the fibreglass vessel and beads. Introducing the new EconoBead 100 and EconoBead 140! The introduction of these larger models completes the EconoBead range! The EconoBead 100 and EconoBead 140 come with 2” multi-port valve, a powerful blower, a transparent lid, bottom drain and beads. “FILTER” : water enters the EconoBead filter and goes upward through the beads and exits out of the vessel via the top spray bar to return to the pond. “RECIRCULATE” : With the “RECIRCULATE” feature you can bypass your EconoBead filter and flow the water from pond to pump to multiport and back to pond. This comes in handy when you are treating the pond. “WASTE”: allows the water to bypass the EconoBead filter and go directly to waste, such as when you are performing a backwash cycle. You can also use the waste setting to vacuum out your pond without the garbage going into your filter, it bypasses the EconoBead filter via the multiport and goes out to waste. “RINSE”: The first time we use the RINSE feature to wash the beads with the blower which forces huge amounts of air into the vessel and since air rises in water, the beads are broken apart by this action, making a thorough backwash easy to accomplish. After the backwash function we use the RINSE feature again but now with water instead of air. It is impossible to get every little bit of debris out of a filter and this causes these minute particles to exit in the waste line instead of going back into the pond. “BACKWASH”: In this position we let the pump run until the water in sight glass is clear (normally 1 to 2 minutes). The water enters the EconoBead filter from the top spray bar (C) and exits the vessel at (A) and goes out to waste. With the pump running open the valve to the sludge drain. Keep it open for 15-20 seconds, and then shut it. This will purge the large solids that have made it into the EconoBead filter and settled out in the bottom of the tank to waste. It is very important to get them out of the system for overall water quality and more efficient filter operation. *IMPORTANT* Do not open the sludge drain valve with the pump off, as you may loose beads to waste if water is allowed to drain out this valve. 2. Move multiport valve to rinse. Air will go out of the EconoBead filter to waste and a small amount of water when blower is activated. 3. Activate blower unit for 1-2 minutes. During this time the beads and debris is dispersed throughout the interior of the EconoBead filter. This breaks up all trapped particles in the filter allowing the debris to be easily backwashed out to waste. 4. Move multiport valve to backwash mode. Turn pump on and run until backwash water is clear. Turn pump off. 5. Move multiport valve to rinse feature. Turn pump on and run until water is clear. This takes any leftover debris that would have gone back into the pond and sends it to waste instead of sending a grunge cloud of debris back into the pond. Turn off pump. 6. Move multiport valve back to EconoBead filter position and restart pump. You’re done. After you become familiar with the backwash process you can accomplish the backwash cycle completely in about 4 or 5 minutes. Every pond is different; however most people find that backwashing needs to be done once or twice a week.